Danish Video Localization – MS Office 365. Microsoft required multi-lingual video translations in over 42 languages for their latest Outlook.com promo. This project included the transcription and translation of all the on-screen text, captions and graphics into Danish. 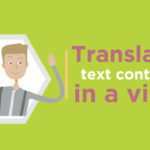 In close partnership with Microsoft’s translation agency, and using the supplied video source files, we were tasked with importing the translated captions into the video. We then adjusted the animations to cater for the size and font of each caption which changes for each language, and then encoding the final Danish video translation as MP4, ready for publishing on the web.